Developed by the Canadian-based company Devolutions, Remote Desktop Manager (RDM) is meant to be used in a corporate, work environment to boost productivity and security. The IT department in particular is going to love the functionality provided by this popular application. You see, RDM offers a secure and efficient means of storing and managing remote connections, passwords and credentials. From a single platform, from a single centralized location, you have access to a lot of info that IT teams need to access. A setup wizard will help you install RDM on a desktop machine powered by any Windows edition from XP Service Pack 3 onward, desktop machine that has .NET Framework 3.5 or newer on it. The aforementioned setup wizard will ask you what sort of shortcuts you want (desktop, Start menu programs folder, startup folder) and will invite you to pick one of three installation options – typical, custom, or complete. Whichever you choose, you will be done in little time. RDM uses a ribbon interface, meaning that buttons for all the features and functions offered by the application are presented on a ribbon at the top. If you feel like the ribbon gets in the way, with a simple mouse click you can hide it out of sight. You can further customize the interface by choosing if you want the windows to be tiled horizontally or vertically, if you want them to be displayed in cascade mode, or if you want to use the tabbed header (which is the default option). You are given a 30-day trial period to uncover and evaluate all the functionality provided by RDM. Speaking about that, here are its main features: centralize and manage your remote connections, securely connect to more than 25 VPN types, more than 60 add-ons to choose from, protect sensitive info, create templates, share and link documents, save and manage passwords, password generator, connect to the cloud, manage and restrict user access, set user specific credentials, and more. The powerful functionality, the user friendly interface, the wealth of features, all these elements make Remote Desktop Manager (RDM) a must-have for IT teams. The system requirements for running RDM are quite low; a simple setup wizard asks you to choose from several installation types. The ribbon interface which can be customized is very easy to use. Remote Desktop Manager offers powerful functionality to manage remote connections, passwords, logins. Free to use for a trial period of 30 days. 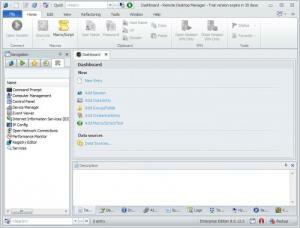 You can download Remote Desktop Manager free here.